After viewing one or two J. Peterman catalogs–from Way back–its novelty–for me– quickly turned into an overdone, too clever by far, terribly predictable publication. That being said, I was gifted one of their Indonesian caftans. Circa 1995. And I wore it and wore it and wore it OUT. Now the fabric is rolled up in strips, soft as butter, fragile as thin parchment. 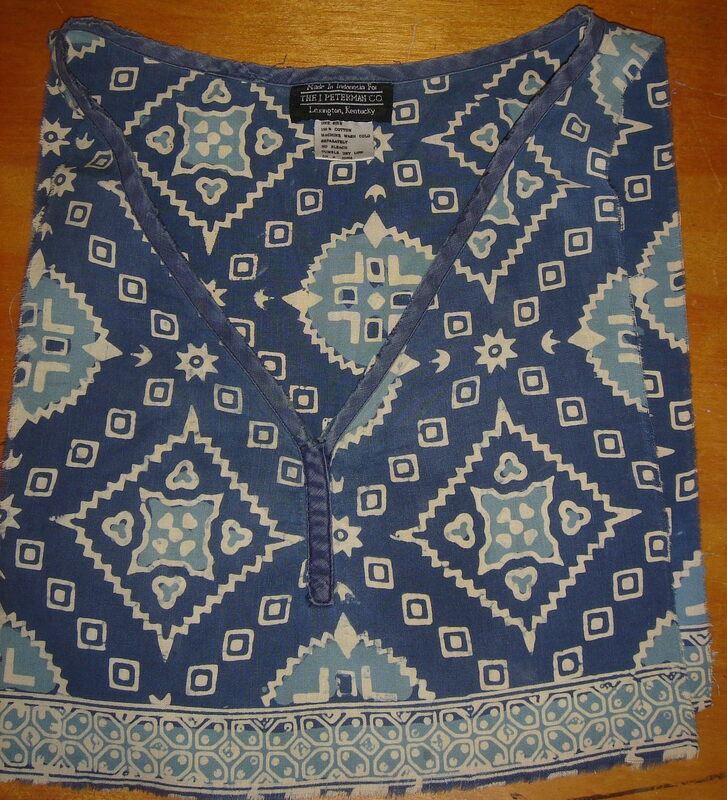 But the color has held and the ethnic designs are still wonderful to ponder. 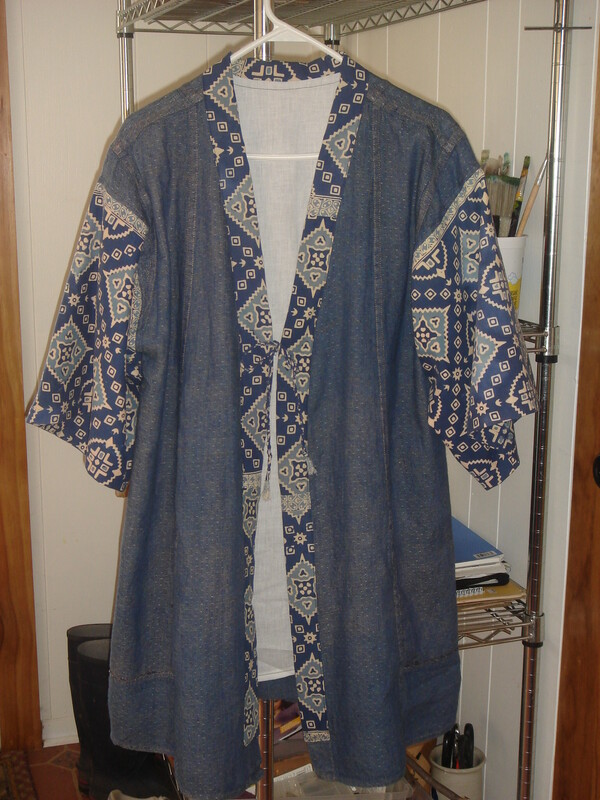 Last summer I found a thrift store oversized shirt–flax– and put it in the indigo vat –and this weekend it became part of the J. Peterman legacy. Of sorts. 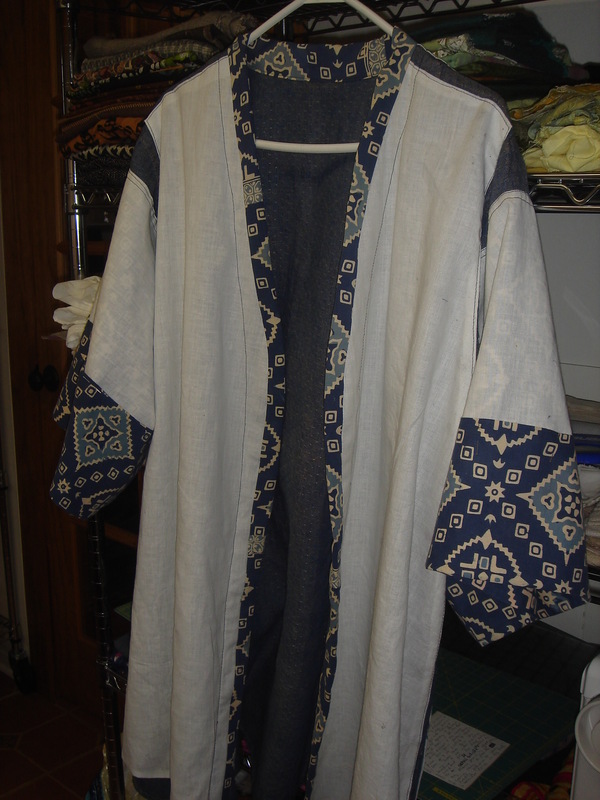 Lopped the sleeves off a few inches from the shoulder–the collar had previously been removed–added kimono-type sleeves and then decided the whole thing needed to be lined. Because the original garment seams were flat-felled, I didn’t take it apart–just did my best to cut a bolt of thrift store muslin into shapes that would contour to the original garment. Finally I made fringe fasteners, again thank you Jude. 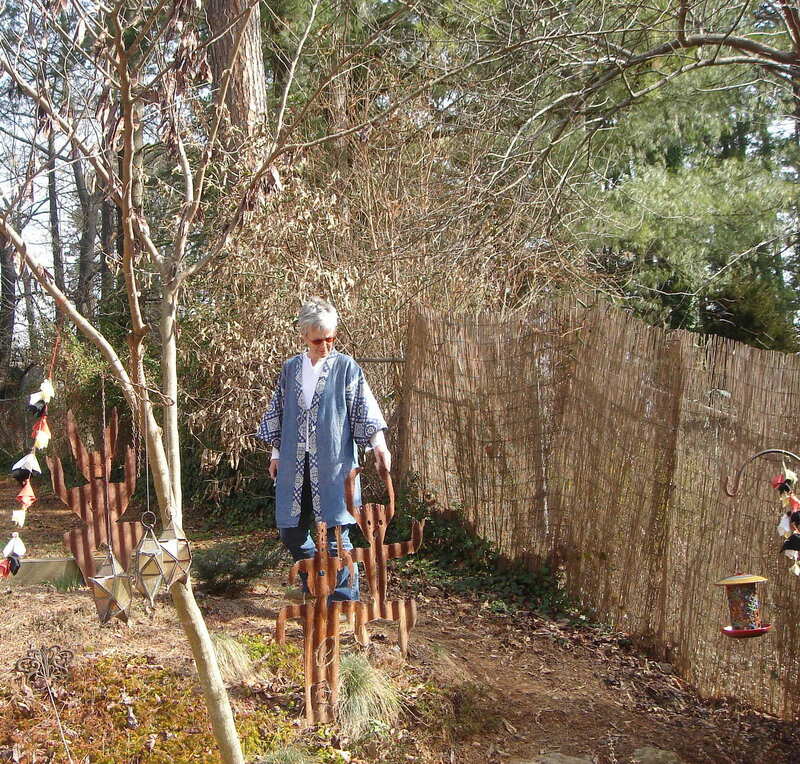 Today is Sunday–and sunny–as Harbinger of Spring stepped out into the sunshine. Actually I hadn’t planned on posting this sequence, and then when I thought about it, I thought I’d do a spoof on the original catalog-type descriptions–along the lines of “winter in the Smokies found her yearning for the warmth of Bali ….” but those thoughts seemed to have a life of their own and I found them creating a scenario/reality that didn’t truly apply to my life, today, here, and yes–now. Finally, “Harold of Spring” evolves at its own pace. (Dee Mallon suggested this reminded her of the “Herald of Spring” and suddenly it was obvious what the name of the cloth would be.) So this is good. Timely. The robins have returned, daffodils are up, and my cloak-coat will see me through. Love that Patricia. It is very much “you.” Like you, I do so long for the spring, only 53 more days to be official. the catalog references are funny. and I can’t wait to see how the robe becomes something more. I, too, am entranced by Jude’s garments. love the elegant simpicirty and seeing you in your garden, are you going to add a pocket or even pockets? was going to add pockets–but then didn’t. if i find i miss having them, after living in the garment for a while, then i will. in some ways it feels so finished! loving your “hope” totems. yes there’s such an elegance of line, it is finished maybe put some pockets on the next one, & thanks for the good words for the hopeful things with feathers, they just keep making themselves in amongst everything else that’s going on.